says one. 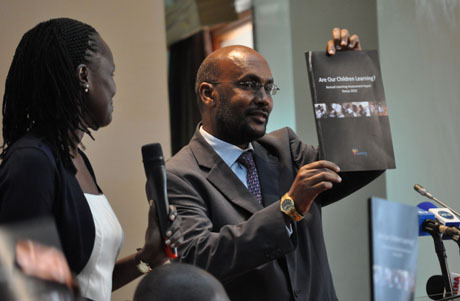 “Kenya Suffers Quality of Education Setback,” adds another. “Shocking Report on Literacy Levels in Schools,” offers a third. reform organization, the bad headlines are good news. And “what is discussed,” in turn, is central to Uwezo’s strategy to raise literacy and math skill levels by at least 10 percent over the next four years among children aged five to sixteen in Kenya, Tanzania, and Uganda. used and not diverted to other purposes. “Overall, I would say what we’ve seen globally is that learning has come onto the agenda in a big way,” says Lynn Murphy, the Hewlett Foundation program officer who manages grants to improve education in the developing world. we’ve greatly increased the effect our own work is having globally. “The face of Uwezo is different in each district,” she continues. “We are working in 124 of 158 districts. Tanzania—all showing abysmally low levels of competence in basic skills. much remains to be done at the national level to maintain momentum. Murphy agrees and adds that changing the thinking among international donors still presents its own challenges. still easy to slip back into the old ways of thinking. providing more money for education or allocating that money differently.